KNOWN AS A NOTORIOUSLY DANGEROUS roadway along some stretches, U.S. Highway 14 in southern Minnesota Thursday grabbed headlines again with two separate crashes about 50 miles and 12 hours apart. One involved a cattle truck, the other a small plane. This time though, only cattle, not people, died. I know this road, The Laura Ingalls Wilder Historic Highway, well as it’s the route my family travels back to my native southwestern Minnesota. I shot this image along U.S. Highway 14 east of Lamberton several weeks ago. Around midnight Thursday, January 5, a semi truck pulling a cattle trailer left Highway 14 just east of the Nicollet County Road 37 intersection near New Ulm and rolled onto its side in the ditch, according to news reports. The driver suffered only minor injuries, but some of the 35 cattle were killed in the crash or had to be euthanized. About 50 miles west and some 12 hours earlier, Highway 14 east of Revere in Redwood County became a runway for a Lakeville pilot who was forced to make an emergency landing, according to news sources. He managed to land his plane on the road before it went into a ditch and flipped. As in the cattle truck accident, the pilot escaped with only minor injuries. When I first heard and read about these accidents, I was simply thankful that the truck driver and pilot survived. I was thankful, too, that others traveling along Highway 14 were not involved. Then I started wondering exactly how many vehicles travel along these sections of Highway 14 each day and how those counts and the timing and locations of the incidents affected the outcomes. According to the most recent statistics I could find from the Minnesota Department of Transportation’s Office of Transportation Data and Analysis, the 2009 annual average daily traffic count was 8,000 for the Highway 14 area where the cattle truck crashed. See how the outcome could have been so much different had this occurred during peak daylight travel hours? Anyone who’s driven Highway 14 between New Ulm and Mankato realizes just how unsafe this narrow, arterial road is with its heavy traffic, county and other roads intersecting the highway and few opportunities to safely pass. Fortunately, 50 miles west, the traffic count drops considerably as the population decreases and the land stretches flat and wide into acres of fields punctuated by farm sites and small towns. Near Revere, where the pilot landed his plane on Highway 14 before noon on Thursday, MnDOT lists the 2007 annual average daily traffic count as 1,550. Odds of putting a plane down without hitting a vehicle were definitely in the pilot’s favor. And given trees are sparse on the prairie, luck was in the aviator’s favor there, too. Fortunately, the emergency landing also occurred outside of Revere, in the 3.5 miles between the town of 100 residents and Highwater Ethanol and not too dangerously close to either. The ethanol plant, of which my middle brother is the CEO/GM, is situated along Highway 14 between the crash site and Lamberton. Viewing a 1994 plat of the area, I spotted a landing strip just to the north and east of Revere. I could not verify whether that still exists and it really doesn’t matter given the pilot claims he had to make a snap decision to put his failing aircraft down Thursday on Highway 14 at a speed of 90 mph. 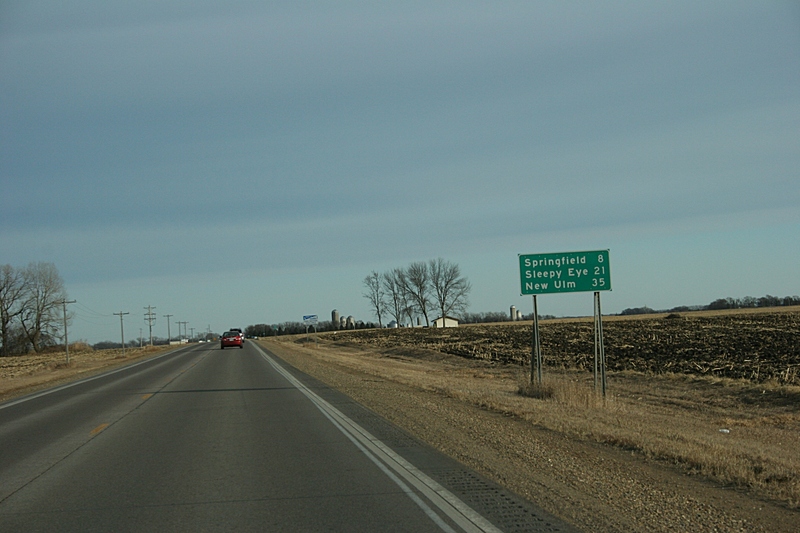 I’m thankful that on January 5, 2012, U.S. Highway 14 in southern Minnesota didn’t rack up more fatal statistics. It’s already had too many.